Escherichia coli has been the workhorse for the production of recombinant proteins (1,2). However, problems often occur in recovering substantial yields of correctly folded proteins. E. coli cannot produce some proteins containing complex disulfide bonds or mammalian proteins that require posttranslational modification for activity. Overexpressed proteins are often produced in the form of inclusion bodies, from which biologically active proteins can only be recovered by complicated and costly denatur-ation and refolding processes. Various techniques have been developed to solve these problems, including the use of different promoters to regulate the level of expression, using different host strains, coexpression of chaperones, reduction of culture temperature, and secretion of proteins into the periplasmic space (see Fig. 1). 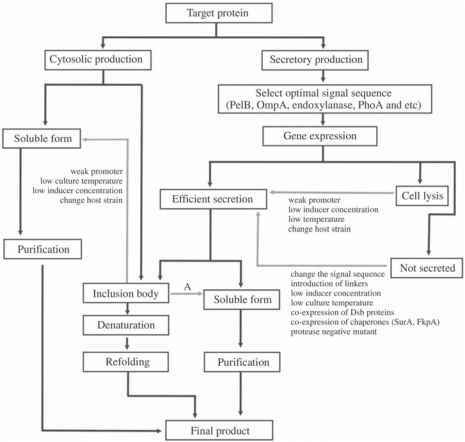 Secretory production of recombinant proteins provides several advantages when compared to cytosolic production (3). First, the N-terminal amino acid residue of the secreted product can be identical to the natural gene product, resulting from the cleavage of the signal peptide by a specific signal peptidase. Second, there are much less protease activities in the periplasmic space than in the cytoplasm (4). Third, purification of recombinant proteins is much simpler because of the presence of less contaminating proteins in the periplasmic space. Fourth, the correct formation of disulfide bonds can be facilitated because periplasmic space provides more of an oxidative environment than the cytoplasm. Fig. 1. 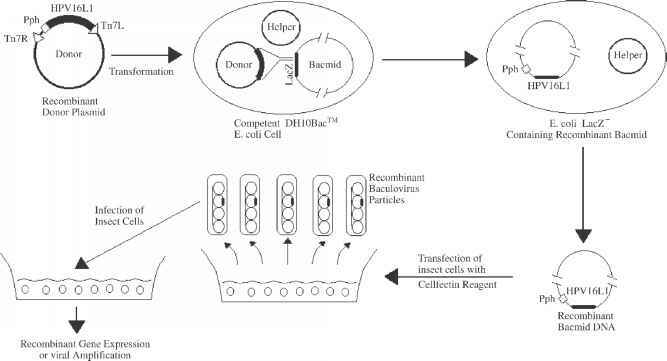 Strategies for the production of recombinant proteins in E. coli. Arrow A can be achieved by one of the methods described for the conversion of "Not secreted" to "Efficient secretion." among these signal sequences, some common structural features have been identified. Table 1 shows the representative signal sequences that have been used for the secretory production of recombinant proteins in E. coli. The signal sequences are typically rich in hydrophobic amino acids, e.g., alanine, valine, leucine, which are essential for the secretion of proteins into the periplasmic space of E. coli. During the transport of proteins outside of the cytoplasm, the signal sequence is cleaved by signal peptidase to yield a mature protein product. Thus, the selection of an optimal signal sequence is important for effective secretory production of recombinant proteins. This chapter discusses protocols for the secretory production of therapeutic proteins in E. coli with human leptin (6,7) and human granulocyte colony-stimulating factor (hG-CSF) (8) as model proteins.